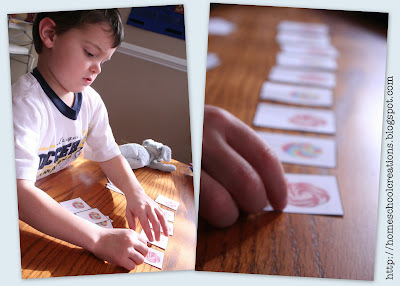 This week I'll be sharing about our preschool fun studying the letter "L" and at the end of the post you will find Mr. Linky so that you can participate too in the fun by sharing what you've been doing during your preschool time. 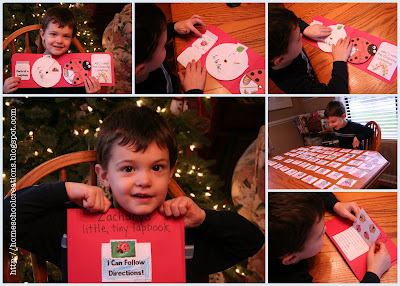 We focused a lot of our letter activities on ladybugs this week, enough that we put together a little lapbook for Zachary, his first, so he was VERY excited! He wanted me to write his name a special title on it, so that I did: Zachary's little, tiny lapbook. The alphabet book page for the letter "L" was a Ladybug. I took the easy way out and cut the pieces out of construction paper instead of adding paint to the mix this week. I figured we had enough going on and red paint + Zachary might = a big mess. These little ladybugs turn out so cute! I used one of my scrapbooking inkpads and let Zachary use his thumb/fingerprint to make the little ladybugs all over the paper. Then we used a pen to put dots on our ladybugs along with antennaes and legs. 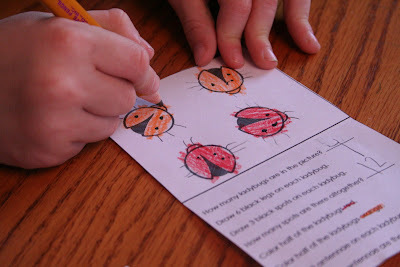 We put our ladybug learning onto paper and added the pieces to our lapbook. We made a wheel on the lifecycle of a ladybug, played an alphabet matching game using uppercase and lowercase letters, and learned the parts of a ladybug. First we had a little fun drawing lines: curvy, straight, up/down, left/right. Then we worked on following directions and added this part to our ladybug lapbook. We counted how many ladybugs there were, added spots, antennae and colored the ladybugs by following the directions. Matthew 5:16- "Let your light so shine before men that they may see your good works and glorify your Father in Heaven.." After all the trouble we had learning the 5 words in the verse, wouldn't it figure that he can almost completely quote this verse? Go figure. We practiced our letter writing this week using Peterson Directed handwriting. It's a handwriting curriculum that we're trying out with just Zachary right now (stay tuned because I'll keep you posted on how it's working for us). There are so many amazing things to do for school! I am overwhelmed! Neat ideas! I'm happy to share my first post! P.S. I hope I used your Preschool Corner side Bar correctly - is it supposed to link back to your site if you click on it? Mine doesn't, but I see that it has your link on it. I know this is a past post but I wanted to thank you for the link to Homeschool Share. 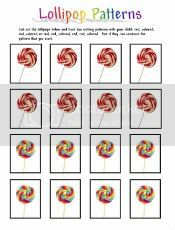 We has used the site in the past when I did BFAIR with my oldest son and I did not seen this information a their site before. I must have missed it. Now thanks to you, I can do these activities with my sons. We are doing the Letter L this week.